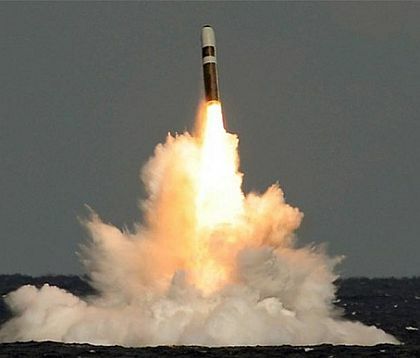 The U.S. Navy is investing more than a quarter-billion dollars to upgrade the missile guidance systems in the Trident II D5 submarine-launched nuclear ballistic missile. The Navy Strategic Systems Programs Office in Washington last week awarded two Trident II upgrade contracts — one to Charles Stark Draper Laboratories Inc. in Cambridge, Mass., and the other to Aero Thermo Technology Inc. in Huntsville, Ala., for Trident II nuclear missile guidance upgrades. The Trident II is the primary weapon aboard Navy Ohio-class ballistic missile submarines. The missile has a range of more than 7,000 miles and carries four independently targeted 475-kiloton nuclear warheads. Draper Lab received a $257.8 million contract to provide MK6 MOD 1 guidance upgrades to the Trident II nuclear missile, including circuit card assembly materials with electronic components, as well as data package assemblies. Aero Thermo, meanwhile, received a $6.8 million contract to provide guidance systems, technical, analytical and program services to support the TRIDENT II missile. The contracts are part of the Navy’s Strategic Program Alteration (SPALT) for the Trident II D5 missile. Aero Thermal engineers will support key guidance system technology development and coordination between the Navy and U.S. Air Force for current and next-generation strategic systems. The Navy and Air Force are working together on strategic ballistic missile technology development. Both services invest in research to ensure unique and critical design and development skills for strategic weapons. Draper Lab will do its work in Pittsfield, Mass. ; Cambridge, Mass; Clearwater, Fla.; Terrytown, N.Y.; and El Segundo, Calif., and should be finished by the end of 2016. Aero Thermal will do its work in Huntsville, Ala., and should be finished by the end of this year. Aero Thermal’s contract has options that would increase the contract’s value to $20.7 million and extend work through the end of 2015. These contracts are part of a Navy effort begun in 2002 to extend the life of the D5 missiles to the year 2040 by replacing obsolete components with commercial off-the-shelf (COTS) hardware. Upgrades involved the missile reentry systems and guidance systems. The first flight test of a D5 extended-life subsystem, the MK 6 Mod 1 guidance system, was in early 2012 aboard the Ohio-class ballistic missile submarine USS Tennessee (SSBN 734). The missile has a range longer than 7,000 miles; has a maximum speed of 13,000 miles per hour, and has precision guidance from inertial sensors with star sighting. No GPS-guided Trident D5 missiles have been deployed. The Trident II missile carries as many as four independently targeted W88 475-kiloton nuclear warheads. That warhead discharges the energy of 475,000 tons of TNT, and is roughly 30 times the size of the U.S. nuclear bomb dropped on Hiroshima, Japan, in 1945. This entry was posted in US Submarines and tagged Aero Thermo Technology Inc, Charles Stark Draper Laboratories Inc, Navy's Strategic Programme Alteration, Ohio Class, SPALT, Trident II D5, US Navy on March 12, 2013 by jasonlockley.